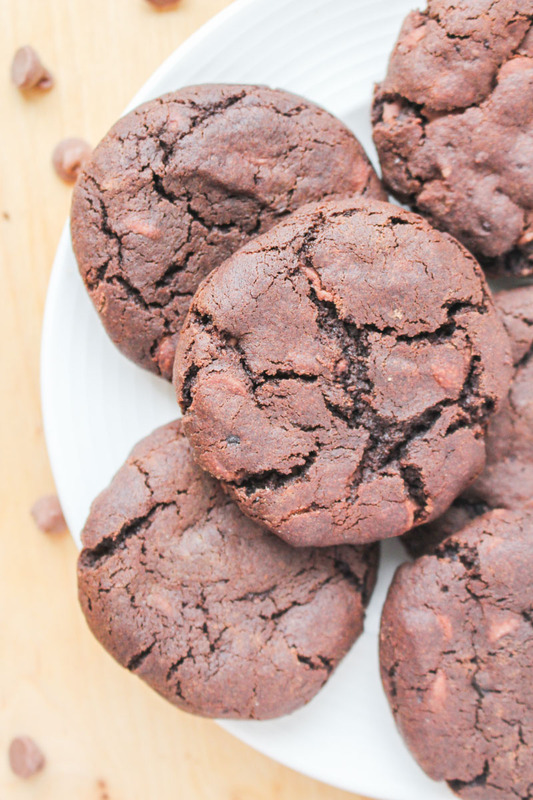 I can’t even cope with these double chocolate chip cookies. I’ve eaten so many of them that I’m not sure I’m going to fit in my wedding dress for my first fitting next week. If you too want a cookie that you cannot stop eating, then these are the babies for you. It is scientifically impossible to just eat one of these. Feel free to try, but you will fail (and have the best time ever doing it). 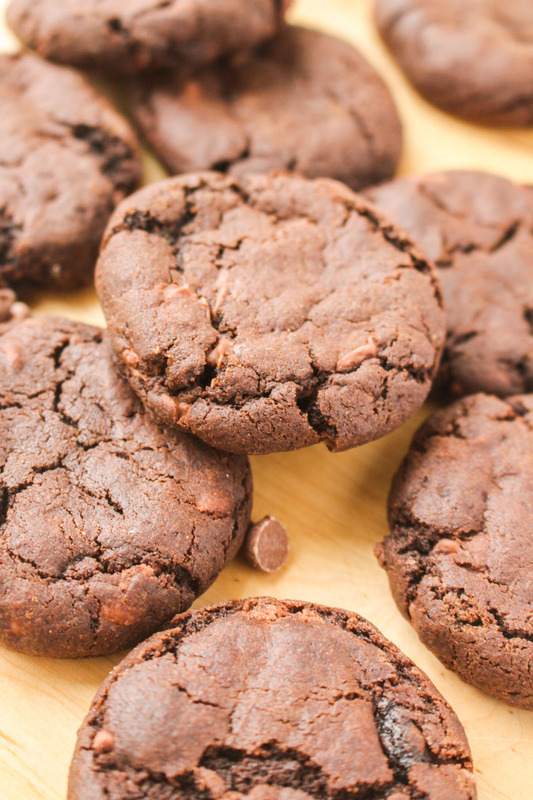 Double chocolate chip cookies as perfect as these are incredibly easy to make. Firstly, you are only going to need one bowl to make them – no chocolate needs to be melted – so washing up is minimised. Even I can wash up one bowl. Secondly, they don’t need to be chilled. Yep, they will stay this thick and chunky without any wasted time spent waiting for them to cool down. Just roll the dough into balls and bake. This is because the dough is really thick, which also helps make them super fudgy. I absolutely adore the cracked appearance on these, which is achieved by pressing down on the cookies when they are fresh out of the oven. I used my hands (bad me) but I would suggest using the back of a spoon or the bottom of a heat-proof glass to avoid hot melted chocolate related injuries. The hardest part of getting these right is to make sure that you don’t over bake them. You will need to make sure you take them out of the oven after 12 minutes, no matter what. They will still feel really soft and squidgy, but that’s okay. This is the magic trick to getting perfect cookies no matter what recipe you use. These cookies will harden up whilst they cool down – just leave them on the baking sheet for ten minutes before transferring them to a wire rack to cool completely. Lazy baker tip – if you are as impatient as me, and want to eat the cookies pretty much straight away, then put them on the freezer once they have been transferred to the wire rack. After ten minutes or so in there, they will be hard enough to pick up and stuff your face with. But maybe try and leave some for your friends? 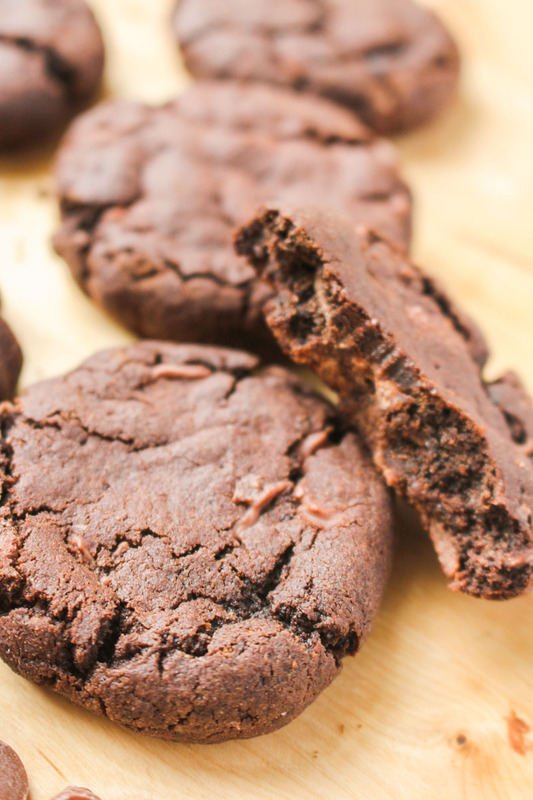 Fudgy and intense, these double chocolate chip cookies are absolutely perfect with a glass of ice cold milk. If you like that sort of thing. Preheat the oven to 180°C / 350°F (160°C fan), and line two baking sheets with baking parchment or greaseproof paper - there's no need to grease. Cream the butter using a stand or hand-mixer until it is pale and all the lumps are gone. Add the two types of sugar to the bowl and mix well. Add the eggs to the bowl one at a time, mixing well between each addition. Add the vanilla extract and mix again. Add the flour, cocoa powder, bicarbonate of soda and salt to the bowl, and mix gently until just combined. Put the chocolate chips in to the bowl and mix gently until well distributed. The dough will be quite stiff, and so you may need to do this by hand. Roll the dough into balls, slightly smaller than a golf ball. Place the balls on to the lined baking sheets, and bake for 10-12 minutes. The cookies will feel very soft, and you will be sure they are not ready, but they will harden up when cooling. If the cookies are too puffy then press down with the back of a spoon or the bottom of a glass when they are fresh out of the oven (this helps make them crinkled like in the photos). Do not bake for longer than the recommended time, or the cookies will be too hard. Leave the cookies to cool on the baking tray for 10 minutes, and then move to a wire rack using a spatula to finish cooling. If you are impatient, you can pop them in the freezer for 10 minutes to harden up faster. The cookies will keep for 3-4 days if stored in an airtight container in a cool place. The unbaked cookie dough balls can be frozen for 2-3 months - bake straight from frozen for 15 minutes. The baked cookies can be frozen for 2-3 months - defrost at room temperature and then store in an airtight container. Hi Iana. The cocoa powder I used is unsweetened – in the UK we pretty much always use unsweetened Dutch processed cocoa powder in baking, as there isn’t really another option in the supermarket! I find that the cookies are sweet enough as per the recipe, but feel free to give sweetened cocoa powder a try if you would prefer. I would be interested to see how they turn out! There is no melted chocolate in these cookies, so you do need a lot of cocoa powder to give them a decent chocolatey flavour ?